Home Website Blog And Others Create Business Email of own .np Domain Which Hosted on Blogger. Create Business Email of own .np Domain Which Hosted on Blogger. We already posted about How to register .np domain name for free and How to redirect Blogspot blog to .np domain name on our previous articles. If you are new and didn't register your free .np domain yet, follow that all steps that mention on above links to create your own blog for free. We suggest preparing cover letter like this Sample Cover Letter To Register Free .np Domain Name before following all steps. There is zero cost to get a domain name and zero cost to host your blog on Blogspot platform. So in this article also we are going to describe Create Business Email of .np Domain Which Hosted on Blogger. Hosting Space provider give the option to create Business Email from there control panel if we buy and host our site or blog there. But Blogspot Free blog hosting provider has no option of the control panel to create the business email. This article is especially focused on that .np domain which hosted on blogger and manages DNS by freedns.afraid.org. Create Business Email of .np Domain Which Hosted on Blogger. 1. Login to your FreeDNS Account. 2. Open another tab and go to this link to register with your domain on free email service provider. 3. Fill Form and SignUp. 4. Verify your Number by giving code that received on your Mobile. 5. 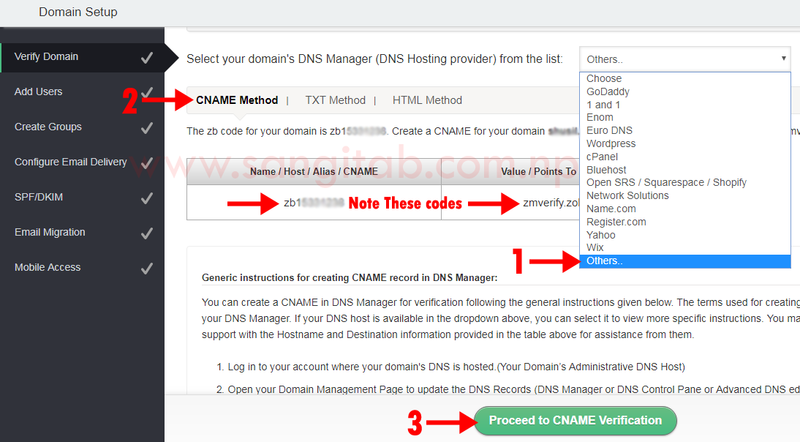 Now verify your domain using the CName method on FreeDNS. 6. Add The CName record to verify domain and MX records to receive and send emails on freedns as shown on the picture below. 7. Configure SPF and DKIM Records according to the email service provider site. That's all. Now you are Super Admin of your domain's email services. You can create more email address with your own domain from the Mail Admin Control Panel. Have any confusion on Create Business Email of .np Domain Which Hosted on Blogger? Leave the comment below we will try to solve it.